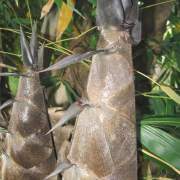 Indonesian Asper is a good looking bamboo, but Black Asper from Java is stunning and is certainly one of the most beautiful plants in the world. 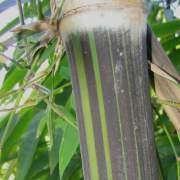 Huge shoots grow into new culms covered with a soft velvet bloom that slowly falls away exposing the blackening culms with green stripes and white bands at the nodes. These shoots are delicious, and the timber grows to large diameters. This bamboo is more cold hardy than Atro, and it grows well here, near Kempsey, Australia. 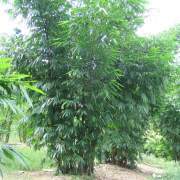 Be aware that it's a huge plant: a giant black bamboo, and can grow more than 25 metres high and so requires room.